Honda is and always will be a Japan-based concern, but it appears that the automaker isn't playing favorites when it comes to vehicle production. 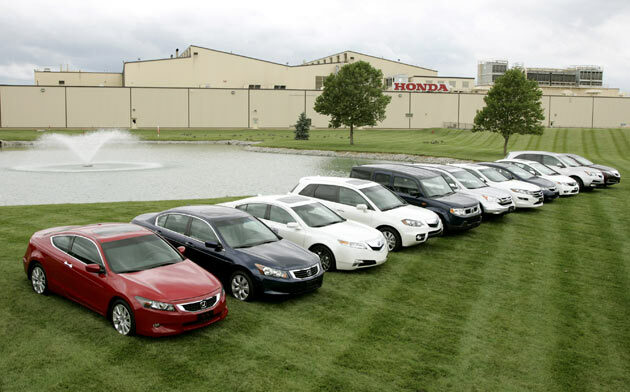 The Detroit News reports that for the first time ever, Honda produced more vehicles in the United States than it did in its home market of Japan. In the second quarter, Honda built 236,819 in the States, compared to 236,559 in Japan. That's a mighty small edge for U.S. facilities, and for the year, Japanese factories are still ahead by 11,000 units, but this trend may continue in the future. Analyst Jesse Toprak at TrueCar tells the DetNews that the key is that there is more growth opportunity in the U.S. than there is in Japan. In short, the market in Japan is shrinking while the U.S. appears to have already hit rock bottom in 2009 and is on the upswing. (We're also guessing that North American production is significantly cheaper than it is in Japan). Honda also expects more growth in emerging markets like China and the plan is to build vehicles where demand is strong. The automaker's global strategy appears to be working, as its $3.2 billion quarterly earnings is the strongest any automaker has announced so far for Q2, 2010. Not surprising. In tokyo its a privilege to have a car. With all the taxes and parking fees, people who can afford all that don't buy cheap hondas, they buy mercedes and toyotas. The only hondas my friend saw there were the new type R civics. And even those aren't made in japan. They are made in Britain which makes even less sense. It's been a long wait...but it's the first time ever!